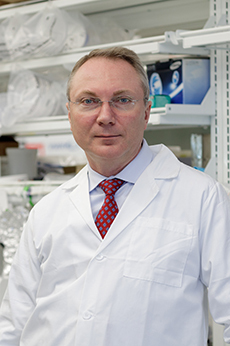 Dr. Igor Efimov is chairman of GW’s Biomedical Engineering Department, which he joined in 2015. He is also the director of Cardiovascular Engineering Laboratory, an NIH-funded cardiovascular research and engineering laboratory that focuses on the physiological mechanisms of cardiovascular disease and on development of novel therapies for heart diseases with emphasis on heart rhythm disorders. In 2008, Dr. Efimov founded Cardialen to develop low energy electrotherapy, with a primary focus on atrial fibrillation. In August 2018, Cardialen raised $16M Series B funding. Prior to GW as the founding chairman of its new BME department, Dr. Efimov served on the faculty of the Cleveland Clinic Foundation (1994-2000) and Case Western Reserve University (2000-2004) in Cleveland, OH; and Washington University in St. Louis, MO (2004-2015). The Efimov Laboratory investigates the mechanisms of arrhythmogenesis during heart failure using human donor hearts, which are rejected for transplantation and human end-stage failing hearts procured at the time of transplantation. The major focus of these investigations is to identify biological mechanisms of cardiac remodeling specific to humans. Dr. Efimov's lab develops and applies an array of state-of-the-art methodologies, including fast fluorescence imaging with voltage-, calcium-, mitochondrial potential-, and other sensitive dyes. The lab’s research is also focused on development of new generation of bioelectronics, based on flexible and stretchable electronics platform developed by their collaborator, Dr. John Rogers from Northwestern University. This revolutionary electronics combined with neuromorphic architecture allows development of high-definition implantable organ conformal and wearable devices for diagnostics and therapy of variety of diseases, as well as for physiological monitoring of health during work, exercise, and other normal and stressful conditions. They aim to develop new generation of implantable and interventional cardiac devices for high-definition diagnostics and treatment of arrhythmias, ischemia, heart failure, and other diseases. Fang H, Yu KJ, Gloschat C, Yang Z, Song E, Chiang C, Zhao J, Won SM, Xu S, Trumpis M, Zhong Y, Han SW, Xue Y, Xu D, Choi SW, Cauwenberghs G, Kay M, Huang Y, Viventi J, Efimov IR, Rogers JA. Capacitively coupled arrays of multiplexed flexible silicon transistors for long-term cardiac electrophysiology. Nature Biomed Eng. 2017 Mar 1; 1(38):1-11. Hsueh B, Burns V, Pauerstein P, Holzem K, Ye L, Engberg K, Wang AC, Gu X, Chakravarthy H, Arda HE, Charville G, Vogel H, Efimov IR, Kim S, Deisseroth K. Pathways To Clinical CLARITY: Methodologies Enabling Quantitative Volumetric Analysis Of Irregular, Soft, And Heterogeneous Tissues In Development And Disease. Scientific Reports, 2017, Sci Rep. 2017 Jul 19;7(1): 5899. PMID: 28724969. Qiao Y, Lipovsky C, Hicks S, Bhatnagar S, Li G, Khandekar A, Guzy R, Woo KV, Nichols CG, Efimov IR, Rentschler S, Transient Notch Activation Induces Long-term Gene Expression Changes Leading to Sick Sinus Syndrome in Mice. Circulation Research, 2017, Aug 18; 121(5): 549-563. PMID: 28674041. Kharche SR, Vigmond E, Efimov IR, Dobrzynski H, Computational assessment of the functional 1 role of sinoatrial node exit pathways in the human heart. PLOS One, 2017 Sep 5;12(9): e0183727. PMID: 28873427. Kang C; Badiceanu A, Brennan JA, Gloschat C, Qiao Y, Trayanova N, Efimov IR, β-Adrenergic stimulation augments transmural dispersion of repolarization via modulation of delayed rectifier currents IKs and IKr in the human ventricle. Scientific Reports, 2017 Nov 21; 7(1): 15922. PMID: 29162896. Vigmond EJ, Efimov IR, Rentschler SL, Coronel R, Boukens BJ. Fractionated electrograms with ST-segment elevation recorded from the human right ventricular outflow tract. Heart Rhythm Case Rep. 2017 Sep 28;3(11):546-550. PMID: 29204352. George SA, Faye NR, Murillo-Berlioz A, Lee KB, Trachiotis GD, Efimov IR. At the Atrioventricular Crossroads: Dual Pathway Electrophysiology in the Atrioventricular Node and its Underlying Heterogeneities. Arrhythm. Electrophysiol. Rev. 2017 Dec;6(4):179-185. doi: 10.15420/aer.2017.30.1. Gloschat C, Aras K, Gupta S, Faye NR, Zhang H, Syunyaev RA, Pryamonosov RA, Rogers JM, Kay MW, Efimov IR, RHYTHM: An Open Source Imaging Toolkit for Cardiac Panoramic Optical Mapping. Scientific Reports, 2018 Feb 13; 8(1): 2921. PMID: 29440763. Jensen B, Boukens BJ, Crossley DA, Conner J, Mohan RA, van Duijvenboden K, Postma AV, Gloschat CR, Elsey RM, Sedmera D, Efimov IR, Christoffels VM. Specialized impulse conduction pathway in the alligator heart. 2018, Elife. 2018 Mar 22;7. pii: e32120. doi: 10.7554/eLife.32120. PMID: 29565246. Tsutsui K, Monfredi OJ, Tagirova (Sirenko) SG, Maltseva LA, Bychkov R, Kim MS, Ziman BD, Tarasov CV, Tarasova YS, Zhang J, Wang M, Maltsev AV, Brennan JA, Efimov IR, Stern MD, Maltsev VA, Lakatta EG, A coupled-clock system drives the automaticity of human sinoatrial nodal pacemaker cells. Science Signaling, 2018 Jun 12; 11(534). pii: eaap7608. doi: 10.1126/scisignal.aap7608. PMID: 29895616. Aras KK, Efimov IR, Irreversible Electroporation: Proceed with Caution. Heart Rhythm. 2018 Jul 28. pii: S1547-5271(18)30724-0. PMID: 30063994. Lin HA, Déan-Ben XL, Reiss M, Schöttle V, Wahl-Schott CA, Efimov IR, Razansky D, Ultrafast Volumetric Optoacoustic Imaging of Whole Isolated Beating Mouse Heart. Scientific Reports, 2018 Sep 20;8(1):14132. doi: 10.1038/s41598-018-32317-1. PMID: 30237560. Aras K, Cathey B, Faye NR, Efimov IR, Critical Volume of Human Myocardium Necessary for Ventricular Fibrillation, Circulation: A&E, 2018 Nov;11(11): e006692. doi: 10.1161/CIRCEP.118.006692. PMID: 30376733. Kessler EL, van Stuijvenberg L, van Bavel JJA, van Bennekom J, Zwartsen A, Rivauda MR, Vink A, Efimov IR, Postma AV, van Tintelen JP, Remme CA, Vos MA, Banning A, de Boer TP, Tikkanen R, van Veen TAB. Flotillins in the intercalated disc are potential modulators of cardiac excitability. JMCC, 126 (2019) 86–95. Cathey B, Obaid S, Zolotarev A, Pryamonosov R, Syunyaev R, George S, Efimov IR, Open-Source Multiparametric Optocardiography, Scientific Reports, 2018, in press. Fellow of the National Academy of Inventors. Fellow of the American Institute for Medical & Biological Engineering. Fellow of the Heart Rhythm Society. Fellow of the American Heart Association. Served as a chartered member of National Institutes of Health Electrical Signaling, Transporters and Arrhythmia (ESTA) Study Section and NHLBI Systems Biology Collaborations review group. Served on numerous expert panels of World Bank, Canadian Academies, British Heart Foundation, Russian Ministry of Science and Education, The Royal Society of New Zeeland, Swiss National Science Foundation, National Sciences and Engineering Research Council of Canada, and other international funds and organizations. Visiting Professor, University of Bordeaux Segalen, Bordeaux, France. Visiting Professor, University of Nizhny Novgorod, Russia. Adjunct Professor, Moscow Institute of Physics and Technology, Russia. Served as associate editor of the American Journal of Physiology: Heart and Circulatory Physiology and IEEE Transactions in Biomedical Engineering. Served on the editorial boards of Circulation Research, Heart Rhythm Journal, Journal of Cardiovascular Electrophysiology, Journal of Molecular and Cellular Cardiology, and other premier cardiovascular and biomedical engineering professional journals. Reviewer for more than 50 international journals. 2016-2021: Leducq Foundation Transatlantic Network of Excellence “RHYTHM: Repolarization HeterogeneitY imaging for personalized Therapy of Heart ArrhythMia”. Role: North-American Coordinator. 2016-2020: NIH R01 HL126802 ”Exploration of arrhythmogenic triggers and substrates in heart failure”. Role: Multiple-PI. 2018-2021: NIH R44 HL139248 “Cardiac Safety AI Trained Human Heart and Micro Heart Model”, 2018-2021. Role: Co-I. Efimov, Igor R.; Aras, Kedar; Rogers, John A.; Gremi, Erdit; Pospisil, David; High Resolution Multi-Function And Conformal Electronics Device For Diagnosis And Treatment Of Cardiac Arrhythmias. PCT/US18/16499 Filed 2018/02/01. Efimov, Igor R.; Yun Qiao; Kang, Chaoyi; Li, Zhenyu; Dong, Quan; Li, Baichen; Apparatus And Methods For In Vitro Preclinical Human Trials, PCT/US18/15052 Filed 2018/01/25. Stacey Rentschler, Igor R. Efimov, David Curiel, Induction Of Pacemaker-Like Cells From Cardiomyocytes, U.S. National Phase Patent Application Serial No. 15/554,371. 2017/08/29. Efimov, Igor R.; Kedar Aras; Erdit Gremi; High Resolution Multi-Function And Conformal Electronics Device For Diagnosis And Treatment Of Cardiac Arrhythmias. Serial No. 62/453,184; Priority date February 1, 2017. Efimov, Igor R.; Qiao, Yun; Kang, Chaoyi; Li, Zhenyu; Dong, Quan; Li, Baichen; Apparatus And Methods For In Vitro Preclinical Human Trials. Provisional Application No. 62/450,412. January 25, 2017. Efimov, Igor; Li, Wenwen; Janardhan, Ajit. Methods And Devices For Three-Stage Ventricular Therapy. US 8,874,208 B2. Oct 28, 2014. Efimov, Igor R.; Krinski, Valentin I.; Nikolski, Vladimir P.; Method For Low-Voltage Termination Of Cardiac Arrhythmias By Effectively Unpinning Anatomical Reentries. US 8,639,325 B2. Jan 28, 2014. Efimov, Igor R.; Hucker, William; Cardiac Pacing Using The Inferior Nodal Extension. US 8,391,995 B2. Mar 5, 2013. Wessles, Richard; Sha, Qun; Efimov, Igor R.; Low-Energy Atrial Cardioversion Therapy With Controllable Pulse-Shaped Waveforms. US 8,473,051 B1. June 25, 2013. Efimov, Igor R.; Ripplinger, Crystal M.; Fedorov, Vadim V.; Foyil, Kelley V.; Ambrosi, Christina. Method And Device For Low-Energy Termination Of Atrial Tachyarrhythmias. US 8,509,889 B2. Aug 13, 2013. Efimov, Igor; Li, Wenwen; Janardhan, Ajit. Method And Device For Three-Stage Atrial Cardioversion Therapy. US 8,560,066 B2. Oct 15, 2013. Efimov, Igor R.; Krinski, Valentin I.; Nikolski, Vladimir P.; Method For Low-Voltage Termination Of Cardiac Arrhythmias By Effectively Unpinning Anatomical Reentries. US 8,175,702 B2. May 8, 2012. Efimov, Igor; Li, Wenwen; Janardhan, Ajit. Method And Device For Three-Stage Atrial Cardioversion Therapy. US 8,706,216 B2. Apr 22, 2014. Priority date Dec 11, 2007.